According to a new report released by the United Nations last week, progress against global hunger is moving backwards. That’s right: The number of children and families around the world who aren’t getting enough to eat every day has increased for the third year in a row. Here are the numbers: An estimated 821 million people – approximately one of every nine people in the world – are undernourished. That’s 6 million more undernourished people than in 2016 — and part of an upward trend that started in 2014, when the report put the total at 783.7 million. All in all, roughly 11 percent of the world’s population is now not getting enough to eat. Furthermore, 151 million children under the age of 5 are stunted — small for their age — because they’re not getting enough nutrients. Of those, 50.5 million are suffering from “wasting,” meaning that they’re also severely underweight for their height. Obviously, this is devastating. But why is it happening? Well, for one thing, food shortages are often linked to extreme weather events that can take a toll on agriculture. And since 1990, the number of droughts, extreme heat, floods, and storms worldwide has more than doubled, according to the report. Secondly, the report points out that events like severe droughts can contribute to increased social instability and trigger conflicts. 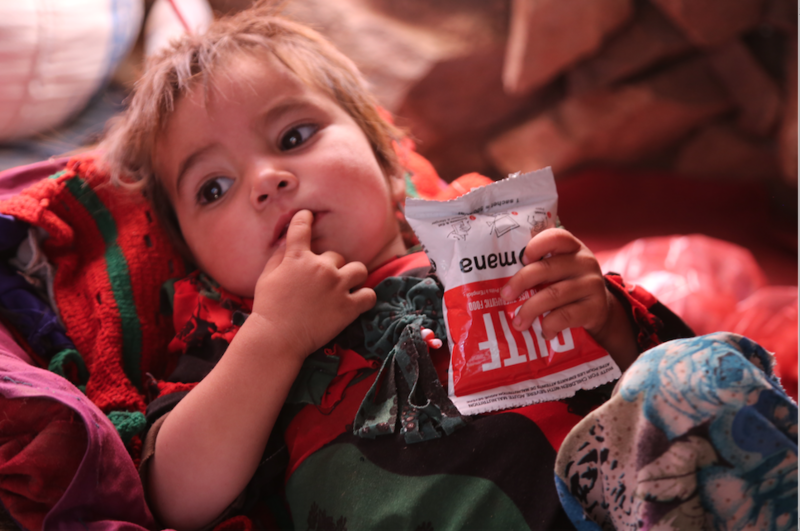 War, violence, and conflict are major underlying causes of nutrition insecurity. Naturally, areas in the world where both climate shocks and conflict are present often suffer from food crises. They have high rates of acute malnutrition in children under 5, like in Darfur in the Sudan (28 percent), South Sudan (23 percent), the Lake region of Chad (18 percent), Yemen (10–15 percent), the Diffa region of the Niger (11 percent), the Democratic Republic of the Congo (8–10 percent), and Afghanistan (9.5 percent). Similarly, 65.8 million people required immediate humanitarian assistance due to conflict in 2017 — and of those, 15.5 million people suffered very extreme levels of acute food insecurity that required urgent life-saving assistance. For example, a few months ago, Gulbibi and her family of five were forced to leave their home province in Afghanistan due to hunger and drought. One of her daughters, 18-month-old Nasima, was on the verge of death when Gulbibi brought her to the World Vision mobile health clinic that serves the Internally Displaced Persons (or IDP) area. The little girl looked pale, restless, and lethargic – and she suffered from malnutrition. At the mobile clinic she was given Ready to Use Therapeutic Food. Since her visit over a month ago, Nasima’s weight has increased from 8 kilograms to 8.5. “I don’t know her exact weight,” Gulbibi says with a smile, “but I can feel she is getting heavier day by day.” World Vision Afghanistan is not only providing emergency response such as food distribution to affected families, but also works on long-term community development, such as establishing water networks in remote and inaccessible areas. Will you join us in action today? The Farm Bill is vital to the fight against hunger: Please use the form below to contact Congress TODAY and urge them to act! Photo: Nasima holding a RUTF packet that she just received from a World Vision Mobile Health Team. ©2018 World Vision, Narges Ghafary.